Been a while, hasn't it? This is what happens when you go to vet school: you lose all your free time as you desperately try to learn all the branches of the maxillary artery, the effects of hyper-vitaminosis of Retinol, and just why we have oral exams for so many subjects. So as you may have surmised, I haven't had much time for sewing. I've sewn a few parts of a Merida costume (her epilogue dress), and I'm planning some projects for the holidays. 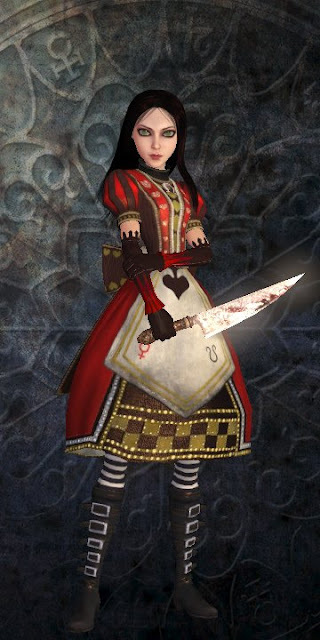 So until I can actually get some sewing done, time for Costume Thoughts! This time, I'm looking at Alice: Madness Returns' Royal Suit dress. This is the dress that Alice wears as she makes her way through the Queen's castle in the game. I love this design. I love the combination of colours and all the little details. Unfortunatley all the details have made this a very complicated project for me. I've tried to make it once or twice, but I haven't succeeded yet. The first time, I accidentally used stretch satin, and had no idea how to do applique, so I gave up because it looked disastrous. There are details everywhere, from head to toe. 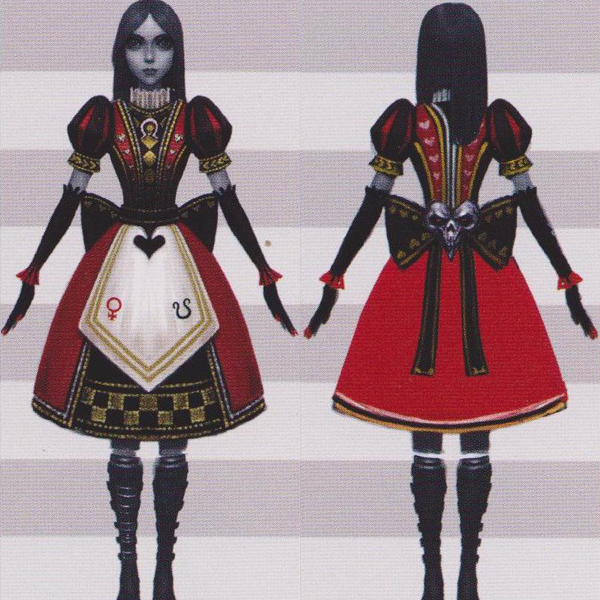 Depending on whether you look at game screenshots or the artbook, Alice either has a little ruff or a black collar with gold trim. I like both designs, though I do like making little ruffs. She's wearing an Omega pendant; hard to see but I think it is attached to the collar of her dress. Then there's the bodice. 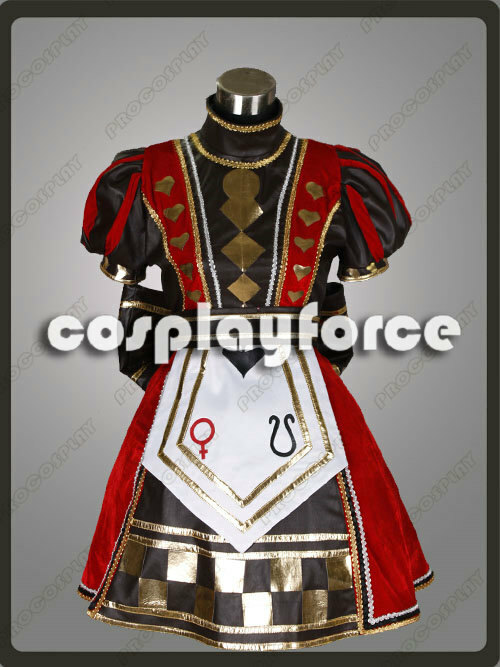 There are alternating panels of black/brown and red, with gold and white details. I've seen some cosplayers sew a black/brown bodice, then sew the red panels on top. They disguise the seams with trim, which often looks really good. There are diamond and heart appliques, and gold and white trim. The gold trim is along most of the seams, with a little white trim here and there. 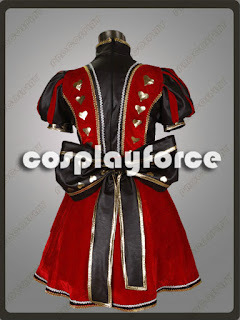 Ric rac trim would be perfect, though I have seen cosplayers using a flat braid trim or bias tape. Her sleeves are puff sleeves. I think this style of sleeve is called 'slashed'. 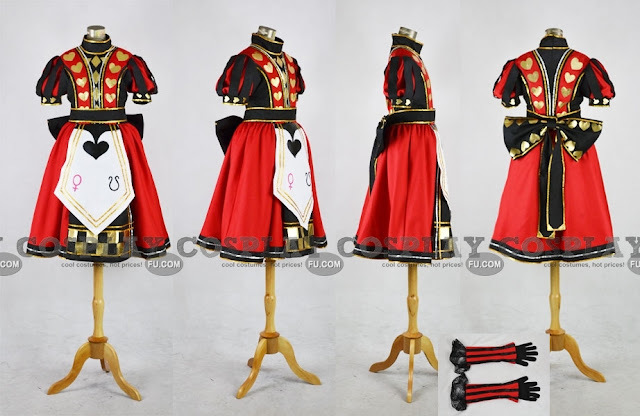 One way of making these is to make a red puff sleeve, then sew strips of black fabric over the gathered sleeve, then sew the whole thing to the bodice. A similar result can be achieve by making a red and black striped sleeve, then pleating it so that the red peaks out from between the black pleats. The sleeve cuff also has applique and trim details. Her lower sleeves look like arm warmers and separate gloves. The arm warmers have a crenallated appearance. 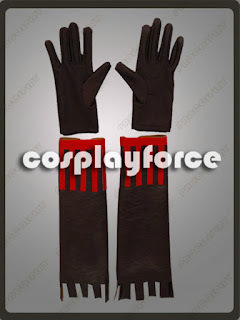 These gloves from cosplayforce look like they are made of a stretch satin. It's tricky to make these crenallations stand up nicely and not flop over, unless you use some kind of interfacing. I'm not sure how I would tackle these. 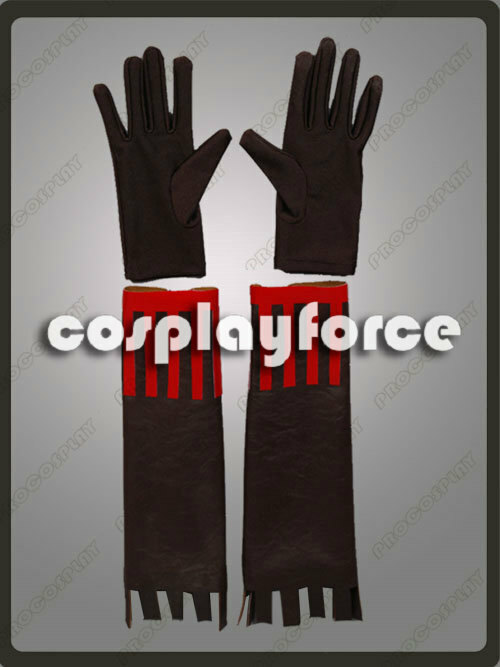 One idea I've had is to make the arm warmers from non stretch fabric, then add elastic to help them fit. 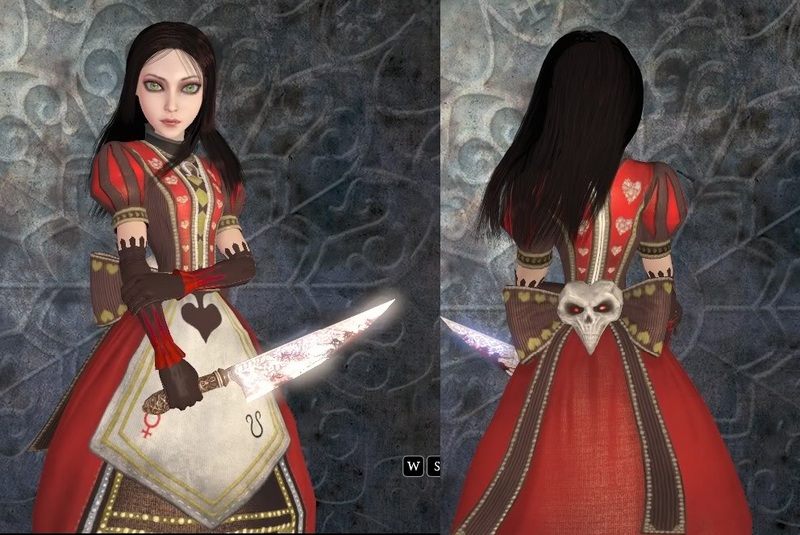 Next is Alice's apron. It has a pointed appearance. Once again there's decorative trim and some appliques: the two astrological symbols, and a black heart (or perhaps a spade?). The apron is attached to a black waistband, with gold trim. At the back of the sash is a large black bow, with gold heart appliques and gold trim. The bow has long tails, also decorated with gold trim. 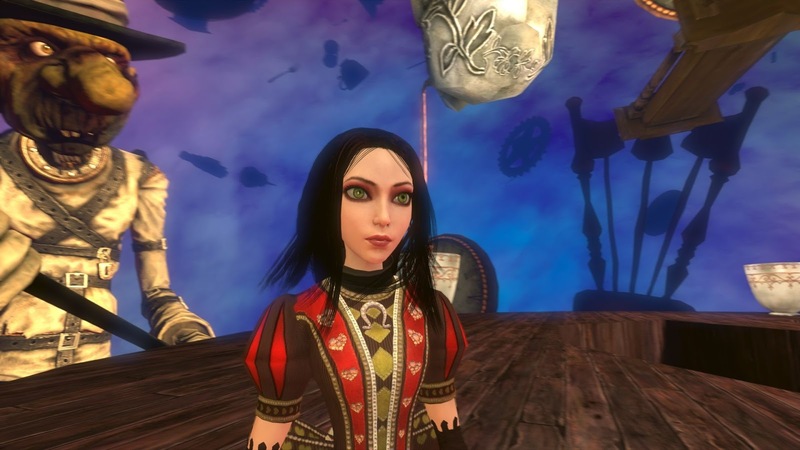 Alice has a skull on the centre of the bow: it might be a stylised bird skull. Some cosplayers used red LEDs for the skull's eyes, which looks fantastic. 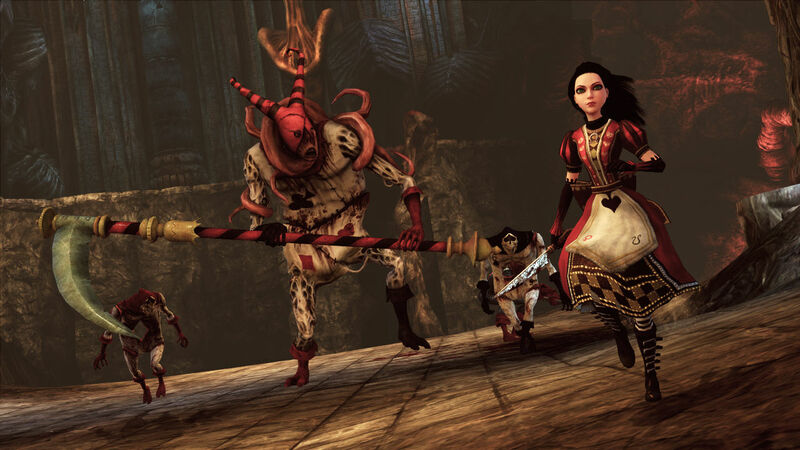 Alice's skirt might be two layers, though you could easily fake that. 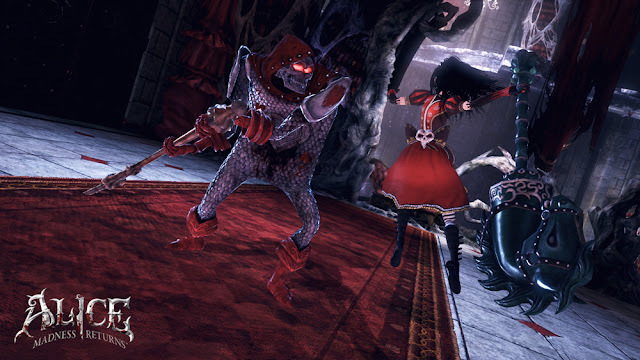 There seems to be a red overskirt (decorated with gold, black and white trim), with a dark underskirt. The underskirt is decorated with gold trim and a chequered applique in gold and black. 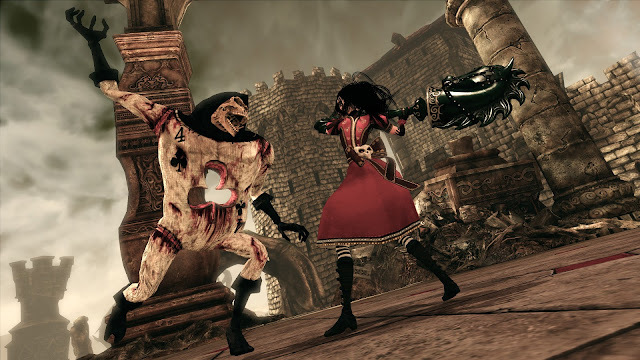 You could get away with creating a single skirt panel for the underskirt, and sewing it to the red skirt: this would save on fabric, and would probably be less bulky and heavy. Alice is wearing striped black and white tights, with black buckled boots. For hot days, thigh high socks would be more comfortable than full tights. Materials: I would choose materials that you are comfortable working with. This dress would look gorgeous in matt satin, but equally nice in velvet. Even a well made cotton dress could look good. I'm planning on using either velvet or matt satin, with interfaced gold lycra for the appliques. The advantage of using lycra for the appliques is that you don't need to satin stitch the edges to prevent fraying. Iron-on vinyl would also look fantastic. The lower sleeves would probably look better made from stretch material.